I wanted to keep Tess's first Easter dress simple, but still wanted her to coordinate with her sisters, so I came up with this a-line Ruffled Chemise: cream linen with a simple round neck and the coordinating pink and cream plaid for the ruffle down the front. The sleeves have a small inverted box pleat which adds another nice detail I think. 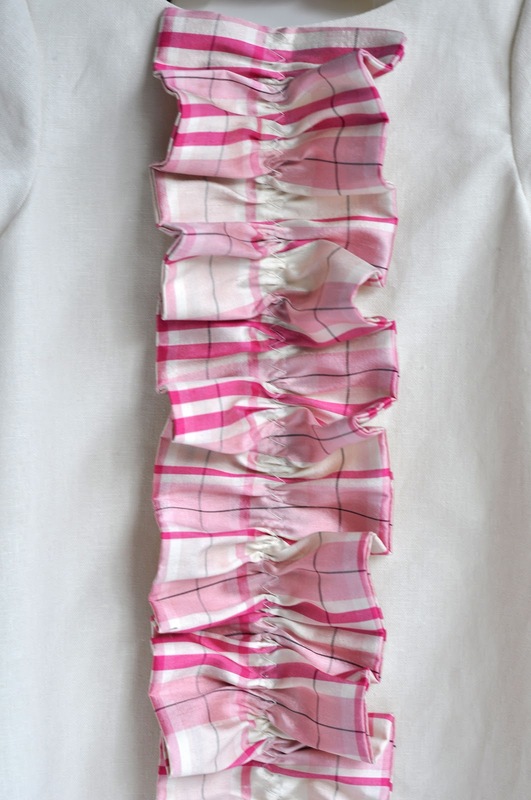 This is the same pattern I used for the sleeveless Ruffled Chemise I made a bit ago. I love it! Such simple lines and not too overwhelming on a baby, but still feminine and fun. It's interesting how different the same pattern can look depending on whether the ruffle is in the same or contrasting fabric. I like it both ways. In fact, I was thinking I may need to make Tess another, and maybe her older sisters too, but for now the pattern is baby-sized for 3 to 18 months. Tess is easier to persuade than her older sisters when it comes to modeling something I made for her. She doesn't really have much choice, but as you can see she wasn't unhappy about it. So I managed to get some pre-Easter pictures of her wearing her very first Easter dress. It happens to be a bit big on her. I made it in a larger size, thinking she may grow quickly this summer and could wear it longer, so it isn't a perfect fit for Easter but should be about perfect in a couple months. As noted with the first Ruffled Chemise, Tess really enjoys sucking on the ruffle. Built-in baby toy I guess! My favorite part of this ensemble may be the plaid diaper cover! I used Dana's pattern available on MADE. So cute! I also love the full lining, and the fact that constructing the chemise this way creates an invisible hem--less stitching to distract from cute baby legs. Phew! Three dresses finished in time for Easter. I just wish I'd been able to get this pattern and post up when I intended, which was a week or two ago, so those who wanted to could make one in time for Easter. I'm afraid our trip delayed things a bit--I actually managed to get the pattern scanned while out of town but couldn't find the computing time required to put together the tutorial. 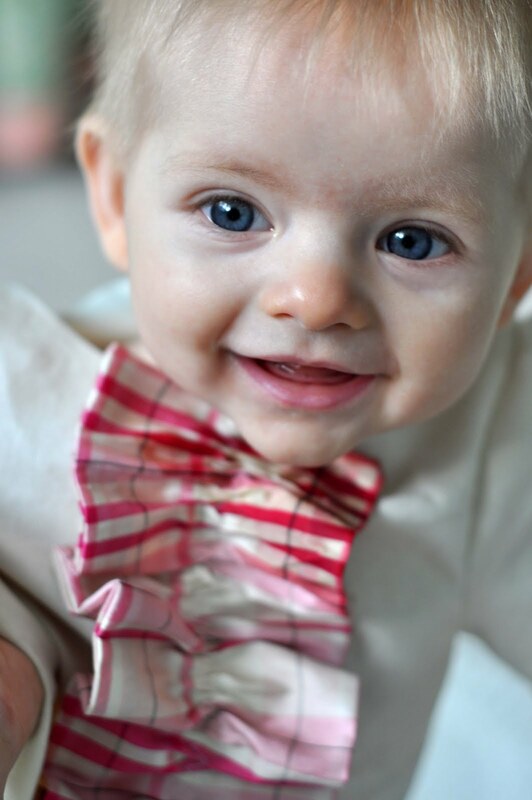 However, there are still some days left and it is a very easy project so if you're inclined--if you have a baby girl who needs an Easter dress--you can likely still pull it off! I always look forward to reading your posts, and what you have recently created. This dress is so beautiful, I love the colour combination you have chosen. wow! Your easter dresses are beautifully constructed. They are so sweet and your girls so lucky. I have just been looking at your past Easter dresses too. They are also amazing. Thank you for the pattern too. I have had your blog on my toolbar menu for a long time but have only just figured out how to comment! What beautiful little ladies you have an such amazing talent for making them things! I have just added a baby girl to my clan (we called her Olive) and can't wait to make a few things! All three dresses are so adorable. You may have even convinced me to learn how to sew. Can't wait to see all three girls together in their dresses. Only you could execute a diaper cover out of SILK without batting an eyelash. Love it! 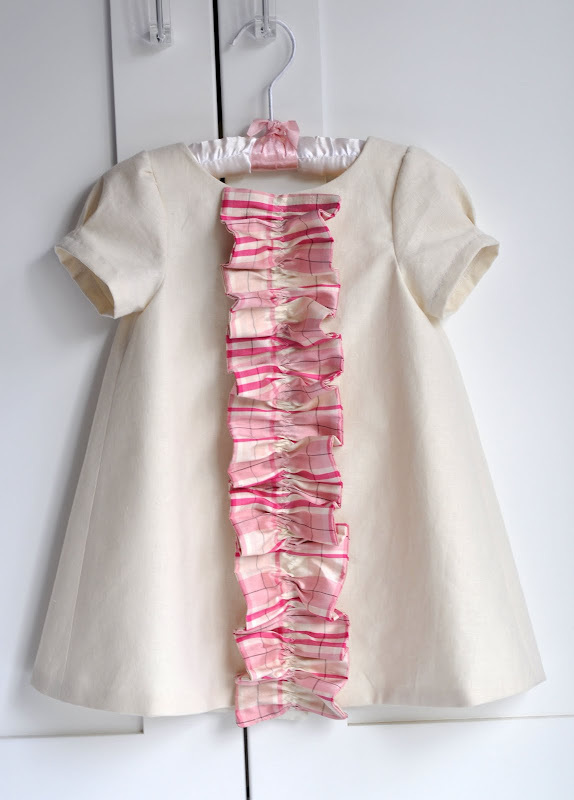 I love the dresses that you have made for your girls. Your baby is just precious!!! She has so much personality in those big blues.. Beautiful, beautiful dress, beautiful kids beautiful names.. Everything is just wonderful! I love it!!! The diaper cover/bloomers may be my favorite part. Have you already moved the pattern to your shop? I cannot get it to download. Thank you for the quick respons! I cut out the fabric already, but I can cut off the seam allowance I extra drawed... Now I have to convert the inches to cm... :) I will mail you the result!!! Very sweet dresses and lovely choice of fabrics. How blessed to have three lovely girls. One comment if I may< I would make the armholes on the sleeveless dress (and the neck opening) much smaller. I think it would give a better fitting result.